Rock climbing has increased in popularity as both a recreational physical activity and a competitive sport. Climbing is physiologically unique in requiring sustained and intermittent isometric forearm muscle contractions for upward propulsion. The determinants of climbing performance are not clear but may be attributed to trainable variables rather than specific anthropometric characteristics. Rock climbing has increased in popularity in the last 15–20 years both as a recreational physical activity and as a competitive sport. Sport climbing is the branch of climbing in which the element of danger is reduced by pre-placing protection points in the rock or indoor wall. Because the danger element is largely removed, the physical difficulty of each climb can be high. Falls are commonplace and are relatively safe. Competitive sport climbing is governed by the International Council for Competition Climbing (ICC) which is a constituent part of the International Union of Alpinist Associations (Union Internationale d’Associations d’Alpinisme (UIAA)). The ICC is responsible for the administration and development of all aspects of the sport of international competition climbing, and the UIAA has been granted recognition by the International Olympic Committee as an intermember federation. There are several different types of climbing competitions: leading, bouldering, speed climbing, and ice climbing. For the purposes of this review, emphasis will be on studies of leading or top rope situations. Leading competitions recreate the challenge facing outdoor sport climbers on indoor climbing walls. A climbing competition usually consists of a series of rounds. Each round progressively reduces the number of climbers and increases the difficulty of the route. Climbers are scored on the height that they achieve, and the routes are designed so that all but one fall before the top is reached. The purpose of having more than one round is to determine the competitor who can consistently perform well and to present a final round of roughly evenly matched climbers. Climbers must attempt the routes “on sight”. This means that they have no previous knowledge of the moves they must make to progress between the holds, and may not watch any other competitors in their attempts. Top rope climbing is when the climber is attached to a safety rope, which is passed through fixed bolt anchors at the top of the climb and returned to a belayer at the start of the climb. This style of climbing is extremely safe, and the risk to the climber is minimised. For climbers to gauge their performance and the difficulty of a climb, a system of climbing grades is used. Several different systems have been developed around the world. Table 1 presents a comparison. For the purposes of this review, we will refer to the rating of difficulty based on the commonly used Yosemite decimal scale (YDS). Technical rock climbs graded with this scale range from the easiest at 5.0 to 5.9; grades from 5.10 upward are further subdivided into a, b, c, and d. The current “maximum grade” is considered to be 5.15b. It is generally assumed that the increments of difficulty progress in a linear fashion—that is, 5.9, 5.10a, 5.10b, etc. However, there can be discrepancies depending on the steepness of terrain and size of hand and foot holds. Ratings are also dependent on the local area climbing traditions, the size or height of the climbers rating the climb, the degree to which the climb can be protected from long falls, and the type of rock. Published climbing studies have used terms to describe climbers such as “elite”,1,2 “expert”,3 and “experienced”.4 Within the available literature there is considerable overlap between these designations. As such, this review will provide the specific climbing grade used in a given investigation. It is difficult to quantify the number of people who participate in climbing activities. The best number of active climbers in the United States is about 300 000 (Editor, Rock and Ice Climbing Magazine, personal communication). This is based on the dollars spent annually in the climbing market and number of shoes and ropes purchased. Few published data exist to quantify the number of climbers world wide, but it is reasonable to suggest that it is in the several million range. The recent surge of indoor climbing facilities and the use of rock climbing as a mode of physical activity has raised questions about the metabolic cost of this activity. In addition, the popularity of climbing as a competitive sporting pursuit has raised questions of ideal training regimens. Despite the increasing number of indoor facilities, widespread popularity of this sport, and the development of local, national, and international competitions, the physiological responses to climbing are not well defined. As such, the purpose of this review is to critically examine what is known about the physiology of climbing. Anthropometric variables and other factors that may be important in determining climbing performance are also discussed. Continuous climbing on a climbing treadmill (four minute bouts at angles of 80°, 86°, 91°, 96°, and 102° relative to vertical) elicited V̇o2 values of 31.3, 31.7, 31.2, 29.5, and 30.9 ml/kg/min respectively.8 The lack of change in V̇o2 with increasing angle (and presumably difficulty) may be because arm specific peak V̇o2 was attained or the differences between angles used in this study were too small to allow differentiation in V̇o2. The ability to climb greater angled and more difficult climbs was probably due to an increased reliance on anaerobic glycolysis. In a separate climbing treadmill study, Booth et al2 had subjects perform a sport climbing specific test of maximal aerobic capacity where they climbed to volitional exhaustion. Maximal oxygen consumption during climbing was 43.8 (2.2) ml/kg/min in a group of intermediate/expert (6b–7a; French system) climbers. In summary, from the available data, it appears that climbing requires use of a significant portion of whole body aerobic capacity. Increases in climbing difficulty, and climbing more steeply angled climbs, probably requires use of anaerobic energetic pathways (see below). Heart rate increases as climbing difficulty increases.6 Reported values during climbing range from 129 to 180 beats/min.2,3,5,6,9 The variability in heart rates may be attributed to different climbing intensities or climbing experience/skill level.9 Nevertheless, it is clear that heart rate increases during climbing efforts. Several studies have noted that there is a disproportional rise in heart rate compared with V̇o2 during climbing.2,5–8 During climbing, Billat et al5 found that climbers reach about 80% of their maximal heart rate for treadmill running and only 46% of maximal treadmill V̇o2. This is consistent with the work of Sheel et al6 who found that heart rate was 89% and 66% of maximal heart rate, and V̇o2 was 67% and 45% of V̇o2max for cycle exercise during harder and easier climbing respectively. Based on more recent data with experienced climbers (see above), coupled with the observations of Williams et al, a more balanced view would suggest that the rise in heart rate is probably due primarily to physiological factors with a smaller contribution from the psychological domain. However, it may be that differences exist in the heart rate response to climbing and falling between the novice and highly skilled climber. Blood pressure has not been directly measured during climbing, although there is reason to suspect that climbers have a different blood pressure response to arm exercise from non-climbers. Ferguson and Brown18 showed an attenuated blood pressure response to isometric handgrip exercise in trained climbers compared with untrained subjects. Enhanced forearm vasodilator capacity was also reported. The reduction in blood pressure may have been caused by a desensitisation of afferent fibres or by a reduced build up of metabolites, which would cause less stimulation of the muscle metaboreflex and the coincident rise in systemic arterial pressure. On the basis of these findings, it appears likely that the muscle metaboreflex is active during climbing and that specific rock climbing training probably enhances this system. Several investigations have measured blood lactate immediately after climbing or during a period of recovery.2–5,7,8 Immediately after climbing, blood lactate ranges from 2.4 to 6.1 mmol/l. The relatively large range of reported values is probably because different investigations have used a variety of climbing modes—that is, sport climbing v climbing treadmill—different climbing terrain—that is, size of holds, steepness of terrain, length of climbing route—and different skill levels of climbers. Figure 2 summarises lactate values at rest and after sport climbing or climbing on a climbing treadmill. Mean values for blood lactate at rest and after climbing. When climbers are at, or near, their maximum ability, what is the maximal lactate accumulation? This question was addressed by Watts et al,3 who measured blood lactate one minute after climbing where subjects were lead climbing at their maximum ability (climbing grade = 5.12b; YDS) and where four subjects fell and were unable to complete the climbing route. Lactate concentration was 2.5 (1.6) mmol/l before the climb and 5.7 (1.7) mmol/l after the climb. These values agree with the findings of Billat et al5: 5.75 (0.95) and 4.30 (0.77) mmol/l after two difficult climbing routes. Climbers in this investigation were also climbing near-maximally (7b; French system). An additional consideration is that during lead climbing, climbers clip a safety rope through a succession of bolt anchors along the route, which requires additional muscular contraction compared with top rope climbing and may result in greater lactate production. However, no data are available to confirm this speculation. When climbers ascend less demanding terrain, there appears to be less accumulation of lactate. Mermier et al7 measured blood lactate two minutes after climbing “easy”, “moderate”, and “hard” routes (5.6, 5.9, and 5.11+ respectively; YDS) where values were 1.64, 2.40, and 3.20 mmol/l. It appears that when climbers are at their maximal climbing ability, blood lactate is about 5 mmol/l. However, a cautious approach should be taken when interpreting these results. Most climbing studies have used different climbing intensities or subjects with variable climbing experience/skill levels. Despite this caveat, it is reasonable to conclude that a significant accumulation of blood lactate coincides with climbing, and it increases with climbing difficulty. It should be noted that blood lactate concentrations are lower with climbing than with activities such as running or cycling. This is probably because a smaller active muscle mass is producing lactate. From an applied exercise physiology point of view, the increase in blood lactate with increasing difficulty probably has implications for competitive climbers. Because climbing competitions often involve sections of overhanging terrain, the ability to tolerate blood lactate accumulation could be of importance.8 Training regimens that optimise this relation would probably be of benefit to the climbing athlete. The ability to recover from a given climb may also be important to competitive climbers, as competitions require the ascent of multiple climbing routes over the course of several hours. Blood lactate concentrations can remain raised for up to 20 minutes after a climb.4 To date, only one investigation has attempted to manipulate recovery strategies and determine the effect on blood lactate. 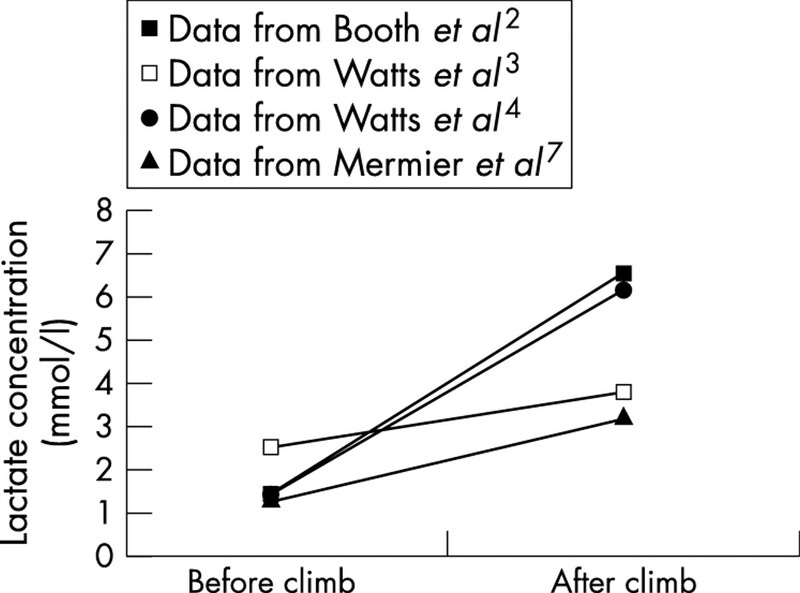 Watts et al3 had subjects climb near-maximally and then perform either passive recovery or active recovery (recumbent leg cycling at 25 W for 10 minutes). Active recovery caused blood lactate to return to baseline values more quickly than passive recovery. This is a well documented phenomenon that occurs after lower limb exercise,19 which appears to hold true for climbing. The activity of the flexor digitorum superficialis and brachioradialis muscles, measured by integrated electromyography, has been reported to be high during hanging using four fingers of each hand and pull ups to maximum elbow flexion.21 The increased recruitment of motor units during climbing-type activities such as these suggests that the forearm musculature may be predisposed to developing fatigue. However, an important consideration is that, although the above laboratory measures may allow quantification of muscle activity, they do not replicate climbing per se. Clearly, additional studies are required to elucidate any climbing-fatigue relation. Several studies have measured anthropometric variables in elite climbers and recreational climbers. Semifinalists for a World Cup sport climbing competition (21 men; 18 women) were characterised as being small in stature with low percentage body fat.22 Reported values for percentage body fat are 4–14 for men and 10–20 for women.22–24 It appears that successful climbers have lower percentage body fat than non-athletic populations, but they do not differ noticeably from other well conditioned athletic groups. In fact, a recent comparison between experienced climbers, recreational climbers, and non-climbers showed no difference for percentage body fat or sum of skinfolds.1 Anecdotally, it is widely held in the climbing community that a reduction in body fat can contribute to an improvement in climbing performance. However, it should be stressed that no investigation has shown an improvement in climbing performance with a reduction in percentage body fat. In addition, physical characteristics of climbers such as arm length, leg length, arm span, and the so-called “ape index” (arm span/height) have been measured in climbers but do not appear to be vastly different from control values.1,24 To date, those studies that have sought to measure anthropometric variables and correlate them with indices of climbing performance have been largely descriptive—that is, no climbing specific training interventions or comparison with non-climbing control groups—with relatively small sample sizes. The relation between percentage body fat and other measures of body dimensions with climbing performance has not as yet been clearly established. What are the determinants of sport climbing performance? This question was recently addressed by Mermier et al,24 who studied 44 climbers (24 men; 20 women) of various skill levels. Variables for each participant included anthropometric measures (height, mass, leg length, percentage body fat), self reported climbing skill and training patterns, and physiological markers (knee and shoulder extension, knee flexion, grip and finger strength, bent arm hang, grip endurance, hip and shoulder flexibility, and upper and lower body anaerobic power). Using a multiple regression analysis, it was shown that training variables explained 58.9% of the total variance in climbing, whereas the anthropometric and flexibility components explained only 0.3% and 1.8% of the total variance. It was concluded that most of the variability in climbing performance can be explained by trainable variables, and climbers do not necessarily need to possess specific anthropometric characteristics to be successful in sport rock climbing. Rock climbing is unique from a physiological point of view because it requires sustained and intermittent isometric forearm muscle contractions for upward propulsion. During climbing, there are increases in oxygen consumption and heart rate, suggesting that it requires utilisation of a significant portion of whole body aerobic capacity. With increasing climbing difficulty, there is an increased reliance on anaerobic energetic pathways, as evidenced by increases in blood lactate and a disproportionate rise in heart rate in relation to oxygen consumption. The determinants of climbing performance are not clear but may be attributed to trainable variables rather than specific anthropometric characteristics. Ideal training regimens to optimise physiological markers and climbing performance have not been identified. Additional research is needed to assess how specific climbing training impacts on climbing performance. Grant S, Hasler T, Davies C, et al. A comparison of the anthropometric, strength, endurance and flexibility characteristics of female elite and recreational climbers and non-climbers. J Sports Sci 2001;19:499–505. Booth J, Marino F, Hill C, et al. Energy cost of sport rock climbing in elite performers. Br J Sports Med 1999;33:14–18. Watts PB, Daggett M, Gallagher P, et al. Metabolic response during sport rock climbing and the effects of active versus passive recovery. Int J Sports Med 2000;21:185–90. Watts PB, Newbury V, Sulentic J. Acute changes in handgrip strength, endurance, and blood lactate with sustained sport rock climbing. J Sports Med Phys Fitness1996;36:255–60. Billat V, Palleja P, Charlaix T, et al. Energy specificity of rock climbing and aerobic capacity in competitive sport rock climbers. J Sports Med Phys Fitness 1995;35:20–4. Sheel AW, Seddon N, Knight A, et al. Physiological responses to indoor rock-climbing and their relationship to maximal cycle ergometry. Med Sci Sports Exerc 2003;35:1225–31. Mermier CM, Robergs RA, McMinn SM, et al. Energy expenditure and physiological responses during indoor rock climbing. Br J Sports Med 1997;31:224–8. Watts PB, Drobish KM. Physiological responses to simulated rock climbing at different angles. Med Sci Sports Exerc1998;30:1118–22. Janot JM, Steffen JP, Porcari JP, et al. 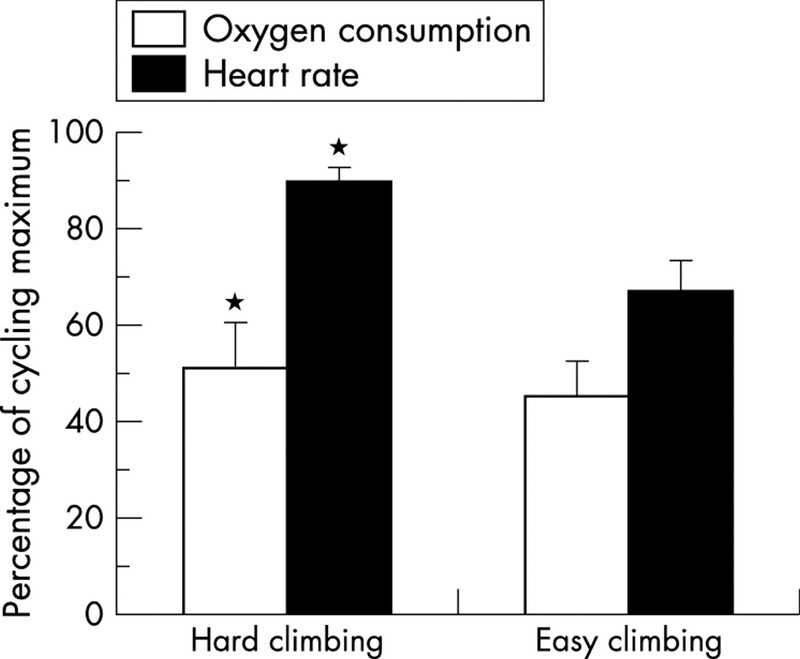 Heart rate responses and perceived exertion for beginner and recreational sport climbers during indoor climbing. Journal of Exercise Physiology Online 2000;3:1–7. Kaufman MP, Forster HV. Reflexes controlling circulatory, ventilatory and airway responses to exercise. In: Rowell LB, Shepard JT, eds. Exercise: regulation and integration of multiple systems. Oxford: Oxford University Press, 1996:381–442. Rowell LB. Arterial baroreflexes, central command, and muscle chemoreflexes: a synthesis. In: Human cardiovascular control. Oxford: Oxford University Press, 1993:441–83. Rowell LB, O’Leary DS, Kellogg DLJ. Integration of cardiovascular control systems in dynamic exercise. In: Rowell LB, Shepherd J, eds. Exercise: regulation and integration of multiple systems. Oxford: Oxford University Press, 1996:770–838. O’Leary DS, Augustyniak RA, Ansorge EJ, et al. Muscle metaboreflex improves O2 delivery to ischemic active skeletal muscle. Am J Physiol 1999;276:H1399–403. O’Leary DS, Robinson ED, Butler JL. Is active skeletal muscle functionally vasoconstricted during dynamic exercise in conscious dogs? Am J Physiol1997;272:R386–91. Astrand PO, Rodahl K, Dahl HA, et al.Textbook of work physiology. 4th ed. Champaign, IL: Human Kinetics, 2003. Astrand I, Guharay A, Wahren J. Circulatory responses to arm exercise with different arm positions. J Appl Physiol1968;25:528–32. Williams ES, Taggart P, Carruthers M. Rock climbing: observations on heart rate and plasma catecholamine concentrations and the influence of oxprenolol. Br J Sports Med1978;12:125–8. Ferguson RA, Brown MD. Arterial blood pressure and forearm vascular conductance responses to sustained and rhythmic isometric exercise and arterial occlusion in trained rock climbers and untrained sedentary subjects. Eur J Appl Physiol Occup Physiol1997;76:174–80. McArdle WD, Katch FI, Katch VL. Exercise physiology: energy, nutrition, and human performance. 5th ed. Baltimore, MD: Lippincott, Williams and Wilkins, 2001. Gandevia SC, Enoka RM, McComas AJ, et al.Fatigue: neural and muscular mechanisms. New York: Plenum Press, 1995. Koukoubis TD, Cooper LW, Glisson RR, et al. An electromyographic study of arm muscles during climbing. Knee Surg Sports Traumatol Arthrosc 1995;3:121–4. Watts PB, Martin DT, Durtschi S. Anthropometric profiles of elite male and female competitive sport rock climbers. J Sports Sci1993;11:113–7. Grant S, Hynes V, Whittaker A, et al. Anthropometric, strength, endurance and flexibility characteristics of elite and recreational climbers. J Sports Sci 1996;14:301–9. Mermier CM, Janot JM, Parker DL, et al. Physiological and anthropometric determinants of sport climbing performance. Br J Sports Med 2000;34:359–65 discussion 366.